The aim of this study was to determine the feasibility of using a newly designed polytetrafluoroethylene (PTFE)-covered metallic stent in the ureter by comparing its effectiveness with that of the noncovered stent in a canine model. We placed 14 stents in the ureters of seven mongrel dogs that weighed 30–40 kg each. The covered and noncovered stents were deployed in the right and left ureters, respectively, of six dogs. In the seventh dog, a covered stent and a double-J catheter were inserted in the right ureter, and a covered stent only was inserted in the left ureter. The first six dogs were sacrificed at 5, 10, and 15 weeks after deployment of the stents (two for each follow-up period), and the seventh dog was sacrificed at 30 weeks. 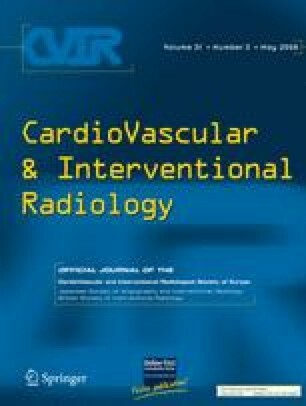 There was no migration or poor expansion of any of the stents observed on plain radiography. On intravenous pyelogram and retrograde pyelogram, all of the covered stents at each follow-up period had patent lumens at the stented segments without hydronephrosis, and the passage of contrast material through it was well preserved. The noncovered stents in the dogs sacrificed at 5 and 10 weeks and one of the two dogs sacrificed at 15 weeks showed near-complete occlusion of the stent lumen due to ingrowth of the soft tissue, and severe hydronephrosis was also noted. The noncovered stent in the other dog sacrificed at 15 weeks showed the passage of contrast material without hydronephrosis, but the lumen of the stent was still nearly occluded by the soft tissue. There was no evidence of hydronephrosis or passage disturbance of the contrast material in both ureters of the dog sacrificed at 30 weeks. We conclude that the newly designed PTFE-covered stent effectively prevented the luminal occlusion caused by urothelial hyperplasia compared to the near-total occlusion of the noncovered stents, and no migration of the covered stents was noted.